So, you’ve got a shiny new MacBook / MacBook Pro — or any number of newer PC notebooks — and suddenly you realize you have no analog video output. 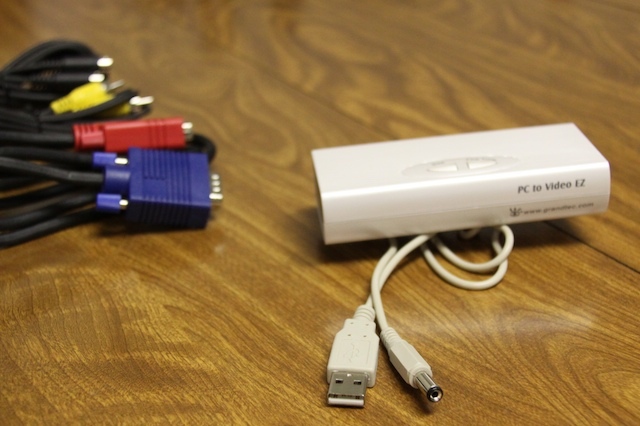 Sure, you might be happy to output to VGA/DVI or even HDMI when you can, but for those Special Moments when that isn’t possible and you need to go a bit oldschool, you need a solution. Short of a pricey scan converter (see extended discussion on our last post on this topic), what to do? 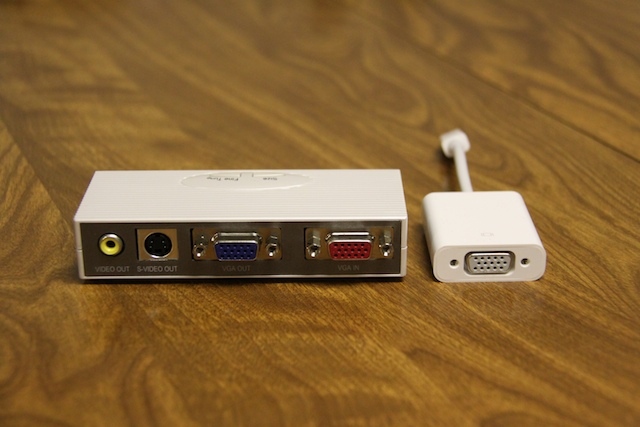 Mini DisplayPort to Composite/ S-Video?? 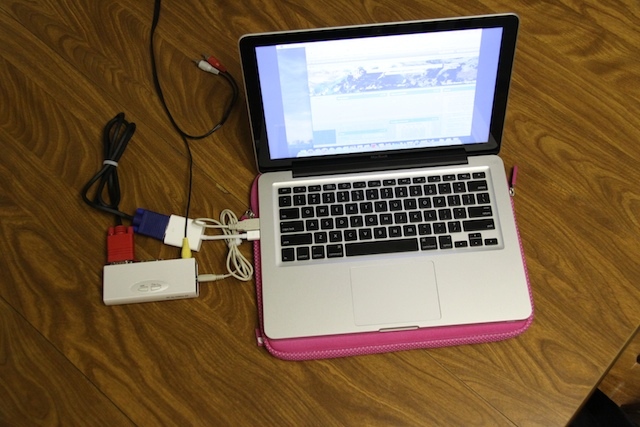 I, and many others, have been looking for a way to output video (composite and s-video) from the NEW Macbooks and MacBook Pro’s sporting the Mini DisplayPort since Apple as yet to release such adapter. 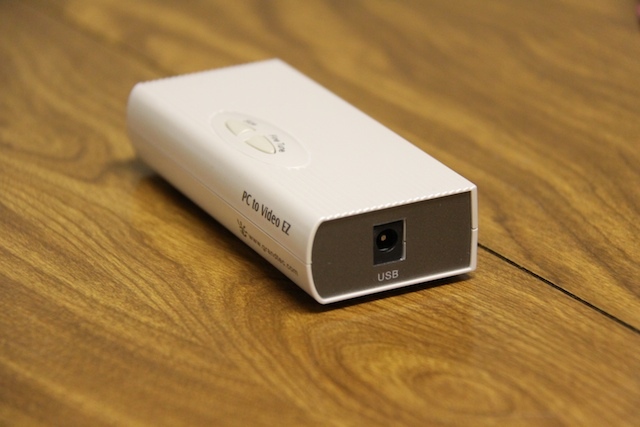 I use my computer to output video (s-video) for digital slide shows and presentations. If our new aluminum MacBook could not meet this requirement back to the store it would go. 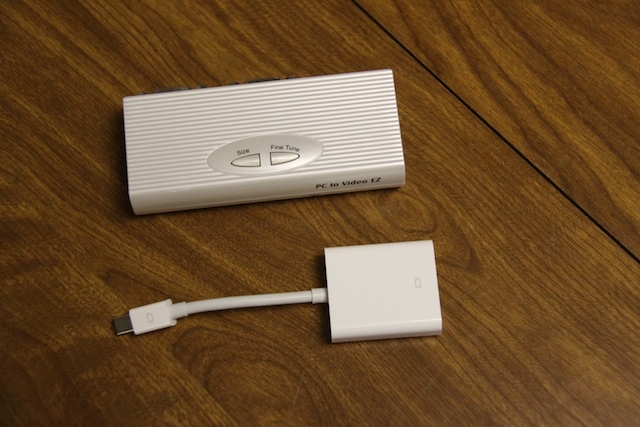 While searching the web for a adapter, converter or whatever could help get video out of the new MacBook I quickly learned ($10 later) that a simple VGA to s-video cable would not work. I soon came across the PC to Video EZ. It is sold at several online retailers but I finaly decided to buy it from NewEgg.com (links at bottom of post). NewEgg is retailer I knew I could trust and get fast shipping from. I ordered the converter box on Friday and it arrived today (Monday) with standard shipping! 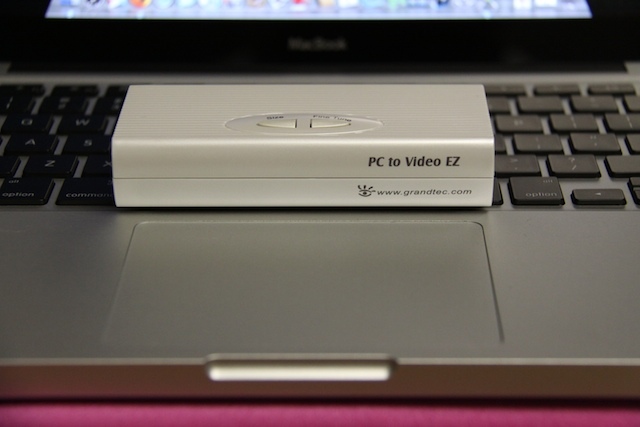 Bottom line, the PC to Video EZ from GrandTec outputs video (both composite and s-video) at equal quality to Apple’s own video adapters used on previous (pre-DisplayPort) computers. I, owning a MacBook Pro with DVI to video adapter, could not tell the difference. The device itself is small. It is nothing you would complain about carrying around and it gets the job done. 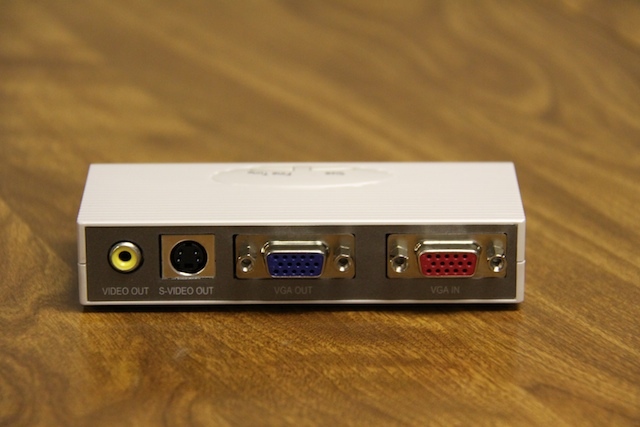 The back of the unit has two VGA ports, one in and one out. 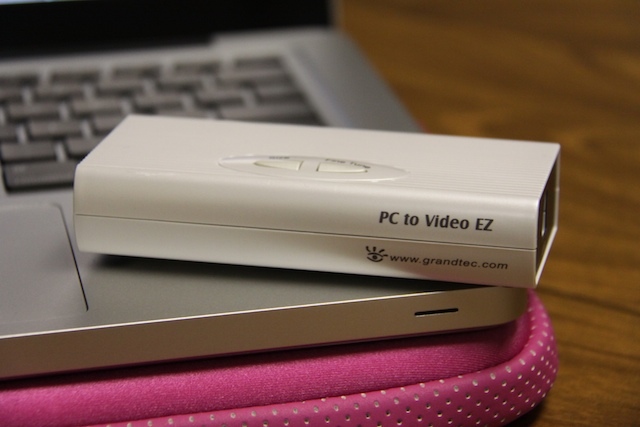 You can use the VGA out port as a pass through so you can still have your computer connected to a VGA monitor while outputting to video. A feature I will never use but it is still nice to have, especially for desktops. Also on the back is the video (“yellow” composite) and s-video out. On the right side of the unit you will find a place to plug in the power adapter. Good news, its powered by USB. 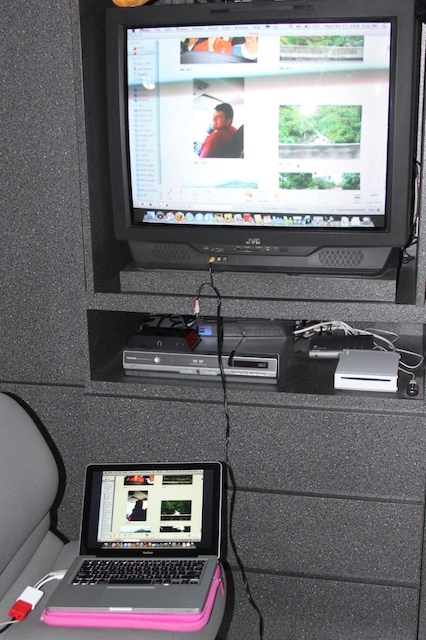 Bad news, the thing needs to be powered at all… More bad news, the unit does not use a standard USB cable. You better not loose the one that comes in the box! At least there are no power bricks to lug around and a simple USB to wall power adapter (like the one used with iPod or the iPhone) should also power the device. My testing showed that power is required. Power in. Why no USB A to USB B? 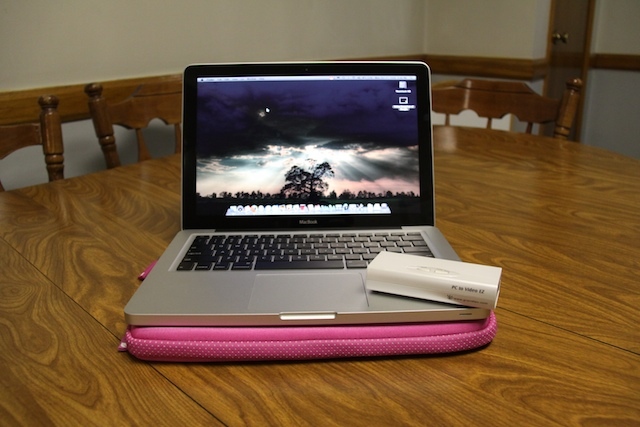 The unit comes with every cable you would need which is a huge plus! 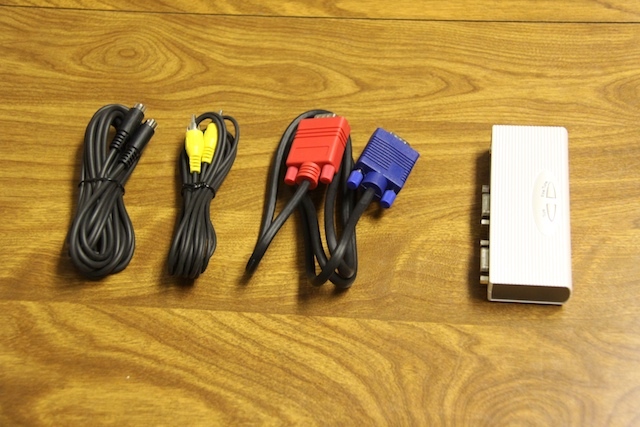 Included in the box is a short VGA cable (3 feet, which is perfect), a s-video cable and a composite video cable. Included cables. All you need to buy is the Mini DisplayPort to VGA adapter. 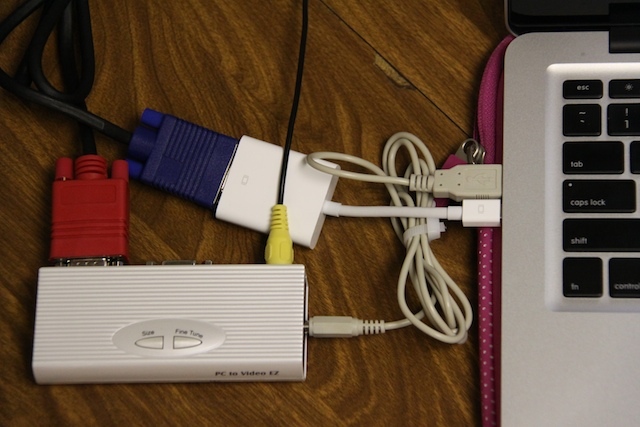 Although not as neat as an Apple Mini DisplayPort to video adapter would be it does get the job done. The unit supports the following screen resolutions & refresh rates. 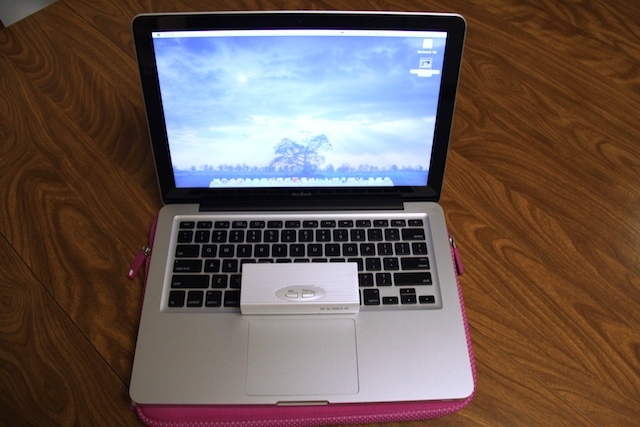 * Power supplied from USB ~NO BULKY EXTERNAL POWER SUPPLY! I HOPE THIS HELPED MANY LOOKING FOR A SIMILAR SOLUTION. I KNOW IF I WOULD HAVE FOUND THIS POST I WOULD HAVE BEEN VERY, VERY HAPPY! PASS IT ON.